Emirates Airlines (EK) offers affordable international flights via Dubai from Johannesburg, Cape Town and Durban. Ask our Travel Consultants - we are itching to assist YOU! When you next spend a night in Dubai, try staying at the JW Marriott Marquis Hotel - the world's tallest hotel! Emirates Airlines is the United Arab Emirate's flag carrier and has a reputation for offering cheap international flights from Johannesburg, Cape Town & Durban to most destinations in the world, via Dubai Airport. Despite the fact that their airfares are often some of the lowest available, they always deliver top-notch service! Skywards has been voted the World's Leading Airline Rewards Programme and Emirates also offer their passengers an enjoyable flight. They recently secured fourth position as World's Best Airline at Skytrax's 2017 World Airline Awards. Emirates has also been awarded for having the Best Inflight Entertainment for thirteen years running. Interested in booking cheap flights on Emirates Airlines? Search, compare and book the most affordable flights on South Africa Travel Online by completing the booking form on the left. Find more information on the airline below. Emirates Flights are rated 4.4/5 based on 12 customer reviews. Want to earn a SouthAfrica.TO flight discount voucher to further reduce the cost of your flight? Simply mail us a review of your latest flight. Find all the details at the link. 19 March 2018. Emirates Airlines will add flights to Mexico City as the Spanish government approved fifth freedom rights for the airline, allowing them to operate flights between Barcelona and Mexico City. Emirates currently operates flights to Barcelona and hope to add a further flight from Barcelona to Mexico City. An official announcement will be made as soon as the plans have been finalised. 05 July 2017. Effective immediately, the electronics ban has been lifted on all Emirates flights to the US. Dubai airport has reportedly put tighter security checks in place that now meets US security requirements. Bomb sniffing dogs are reportedly among the additional security checks that have been put into place. 13 May 2016: The airline has changed their baggage policy for flights to and from Africa, now offering passengers the ability to take even more things with them! Economy class passengers can now take two pieces weighing a maximum of 23 kg each (totaling 46 kg), instead of the previous one piece weighing a maximum 30 kg. Business class and first class passengers can now take up to 2 pieces each weighing a maximum of 32 kg (totaling 64 kg), instead of the previous 40 kg for business class passengers and 50 kg for first class passengers. The new policy only applies to return tickets issued after the 15th of April 2016 for departure from Africa. 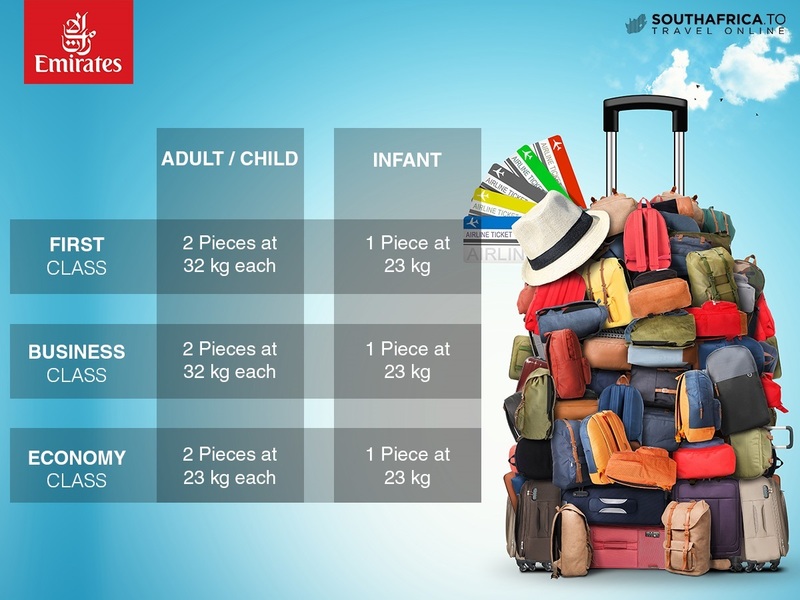 26 June 2015: Economy class passengers departing Johannesburg, Durban and Cape Town will have an additional 10 kg baggage allowance until the end of July 2015. This brings the total to 40 kg. The baggage allowance does unfortunately only apply if you are travelling to one of these destinations: Beijing, Bangkok, Denpasar, Hong Kong, Jakarta, Kuala Lumpur, Seoul, Tokyo, Ho Chi Minh City, Shanghai, Singapore, Amsterdam, Athens, Brussels, Dublin, Dusseldorf, Frankfurt, Geneva, Istanbul, Larnaca, London, Madrid, Manchester, Milan, Moscow, Munich, Paris, Rome, Vienna, Zurich, Ahmedabad, Bengaluru, Mumbai, Kozhikode, Kolkata, Colombo, Kochi, Dhaka, Delhi, Hyderabad, Islamabad, Karachi, Lahore, Chennai, and Thiruvananthapuram. For a long time a golf bag containing clubs and one set of shoes were able to be transported free of charge, but from 1 March 2014 passengers will have to include the golf club weight as part of their free luggage allowance. Since the 9th May 2009 Emirates has had one of the best luggage allowance of any airline in the world - it increased its baggage allowance by 10kg to 30kg in economy class, 40kg in business class and 50kg in first class. This makes it a favourite amongst South Africans who have a lot of luggage when they want to emigrate. With Emirates you have the option of checking in online or in person at the airport. You can check-in online within 24 hours of your flight's departure, but not less than 90 minutes before the departure time. Online check-in is available for all of Cape Town, Durban King Shaka and Johannesburg OR Tambo International Airports. With online check-in you get an eBoarding Pass or a cellphone boarding pass, which you present at the bag drop counter and the boarding gate. If you are checking in, in person, you must present yourself at the check-in counter at least 3 hours before your flight's scheduled departure time. Emirates' hub, Dubai International Airport, is one of the largest and busiest international airports in the world. It is the third-busiest airport in the world by passenger traffic and is the busiest airport by international traffic. Made up of three terminals, Dubai International Airport is more closely comparable to a shopping mall. It is home to several international brands including Shake Shack, Victoria Secret, Boots, Starbucks, MAC, Jo Malone, Baskins Robbins and many more. If you don't fancy duty free shopping then perhaps you'll be interested in one of those fancy lounges where you can indulge in bubbles and a shower on a long layover. Alternatively you can catch some ZZZs for free on one of the many loungers in the airport, but be advised that those go quick and that you'll need to ensure you make your connection. If you book it more than a day before your flight, Emirates can usually (not guaranteed) arrange meals to meet a wide range of special dietary requirements. Examples of meals which can often be arranged are Vegetarian Jain (no root vegetables), Asian Vegetarian (spicy and aromatic), Hindu (no beef), Muslim (Halal), Fruit Platters (no canned fruit), Low Sodium, Non-Lactose, Vegetarian, low calorie, low cholesterol, Diabetic Meal (no sugar), Child Meal, Seafood Meal, bland meals (no spices), gluten-free, with champagne and cakes being possible to order at the time of booking. On 1 November 2013 Emirates started offering a complimentary chauffeur service to its business class and first class passengers who live within 110km of Cape Town, Durban and OR Tambo International Airports. The service must be pre-booked at least 28 hours before the scheduled departure time. If you do manage to secure a nifty upgrade, but not within the first 28 hours, then you can phone directly to try your luck. Depending on availability they might still be able to assist you. Emirates Online bookings with credit cards must be done using the credit card of one of the passengers. If a booking needs to be done using the credit card of a person not flying, then it must be done at an Emirates office. Emirates flies from Cape Town, Durban and Johannesburg to their hub in Dubai and onwards to these destinations. 1 Aug 2014. Flights to Kano & Abuja (Nigeria) commence. Oct 2013. Flights to Conakry are launched. 27 Mar 2010. Emirates commences daily flights between Dubai and Cape Town in an Airbus A340. 1 Oct 2009. Emirates South Africa introduces using the Boeing 777-300ER on all 3 of its daily Johannesburg - Dubai flights, with each flight offering 304 seats in Economy Class, 42 seats in Business Class and 8 Private Suites in First Class. 1 Oct 2009. Emirates starts daily flights between Dubai and Durban. A delegation led by Sultan Bin Saeed Al Mansouri, Minister of Economy, was aboard the inaugural flight. Among those on board the inaugural flight were Saif Salem Al Humrani of the UAE Ministry of Economy; Mohammad Mahgoub, Director, Administrative Affairs, Dubai Chamber of Commerce and Industry; Yaser Sharaf, Managing Director, Sharaf DG; Michael Mabuyakhulu, Member of Kwa Zulu Natal’s Executive Council for Economic Development and Tourism; Nigel Page, Emirates Senior Vice-President, Commercial Operations, Americas and Africa; Ahmad Khoury, the airline’s Senior Vice-President, GCC, Middle East and Iran and Peter Sedgley, Emirates’ Senior Vice President, Cargo Commercial Operations. Sibusiso Ndebele, South Africa’s Transport Minister, said: "The people of Kwa Zulu Natal are now able to reach more than 100 global destinations, and similarly more than 100 points of the globe are now able to reach the wonderful city of Durban." Al Mansour said " This is an important development for Dubai, for Emirates airline and for the UAE as a whole. South Africa is an important trading partner for the UAE and to have another gateway into the country will further strengthen our trading relationship and provide a new channel for growth. I am sure it will also be very much appreciated by the South Africans who live and work in Dubai." 22 Jul 2009. From the 22nd July 2009 until the 23rd August 2009 Emirates held a number of road shows in various towns in South Africa, to advertise their new Durban - Dubai flight route. The roadshow will take place in Umhlanga, Pietermaritzburg, Port Elizabeth, Knysna, George, Cape Town, Polokwane and Bloemfontein, before wrapping up in Johannesburg a month later. Dec 2008. Flights between Dubai and Durban were scheduled to start (postponed in June 2008, with the reason cited being the rising cost of fuel). 30 Mar 2008. First Emirates flight from Dubai to Cape Town, EK770, is piloted by Captain Chris Rademan (a South African). Cape Town became Emirates' 100th global destination. 1986. Emirates launches flights to Cairo, the airline's first African destination. 16 Jul 2014: Emirates will commence daily flights to Budapest from the 27th of October 2014. They will use a A330-200 aircraft on this route capable of seating up to 278 passengers with a two class configuration. 4 March 2016 : Emirates now holds the record for the world's longest nonstop flight between Dubai and Auckland, New Zealand. The flight takes a whopping 17 hours and 15 minutes. The route will be operated by a Boeing 777-200LR. This will however soon be eclipsed by Emirates flights from Dubai to Panama City which will take 17 hours and 35 minutes to complete. 26 Mar 2015 : Emirates will commence daily flights between Dubai and Orlando, Florida from the 1st of September 2015. A Boeing 777-200LR featuring 216 economy class seats, 42 business class seats (full lie-flat beds) and 8 first-class suites will be used on the route. 10 Mar 2014 : Emirates commences daily flights from Dubai to Boston using a B777-200LR. 10 Feb 2014 : Emirates launches flights from Dubai to Taipei Taoyuan International Airport (DXB-TPE) with 6 weekly flights on a B777-300ER. From 4 December 2013 Emirates commences flights to Kabul Khwaja Rawash Airport in Afghanistan. 5 Nov 2013 : Emirates commences flights to Sialkot in Pakistan, 4 times a week in an A330-200. From 1 May to 20 July 2014 there is runway maintenance going on at Dubai Airport, which may result in Emirates reducing its scheduled flights. 16 January 2014. Flights are launched from Dubai to Kiev, in the Ukraine, in an Airbus A340-500. Flights are scheduled to leave Dubai at 17h15 and land in Kiev at 20h35. Emirates' VP, Hubert Frach, says that "We see strong potential in the Ukraine through its agribusiness, heavy machinery industries, technology, and tourism. Kiev will be our 35th passenger route in Europe and Emirates' customers in the Ukraine will be able to fly non-stop to our Dubai hub and conveniently connect onwards to Asia.". This creates the opportunity for 1-stop flights from CPT, JNB & DUR to Kiev. 2014-01-01 Emirates switches from using a B777-300ER to a 517 seat A380 on its Dubai to Zurich route. 4 December 2013. Because of an increase in demand, Emirates adds a second daily flight to Amsterdam on a B777-200LR plane. 28 October 2013. Emirates starts flying 4 flights a week to Conakry in Guinea using an A340-300. It's a circle route from Dubai to Conakry to Dakar and then back to Dubai. 27 Oct 2013. Emirates introduces a second daily A380 flight service from Dubai to Bangkok, and overall increases daily flights to 6. 27 Oct 2013. Emirates introduces a fourth daily flight from Dubai to Hong Kong. 1 October 2013. Emirates launches flights to the Philippines' Clark International, the second route to the country. The Philippines Ambassador to the United Arab Emirates, Grace Princesca, said that “It is very significant that Emirates is flying into another destination in the Philippines because it will open a whole vista of opportunities for both our countries. It will help Filipinos all over the world; they’re passing through the Dubai hub and riding one of the largest airlines in the world to fly nearer their communities of origin”. 4 Sep 2013. Emirates commences flights to Stockholm. Emirates President, Tim Clark, says that "Following our successful launch into Copenhagen, Denmark in 2011 we have been closely evaluating options for further expansion in Scandinavia. Sweden, with its stable and growing economy is the perfect location to extend our regional presence. "This new service will provide the only scheduled direct passenger service between Dubai and Sweden, giving passengers out of Sweden much easier access to our international network including convenient connections to popular destinations such as, Thailand, where we currently operate six flights per day. Timing new services to connect seamlessly across our network is an integral part of our planning. Having carefully assessed traffic trends we have ensured that passengers from Sweden will be able to reach over 25 destinations across the Far East with minimal transit time in Dubai, something that is incredibly valuable to our customers." 1 Sep 2013. 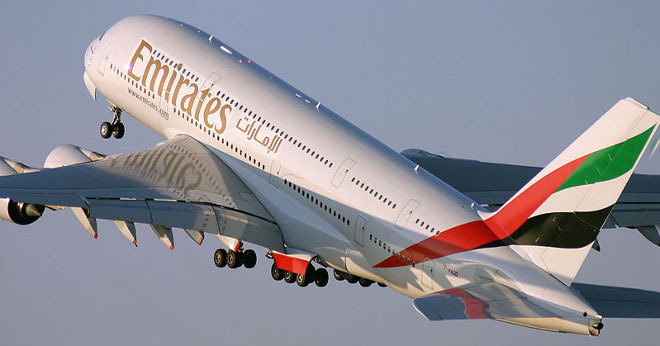 Emirates resumes flights from Dubai to Tripoli, Libya. 30 Jun 2013. Three more weekly flights from Dubai to Colombo (Sri Lanka) are added, taking the total to 31 a week. The flights will be flown in B777-300ER planes. 17 Jun 2013. 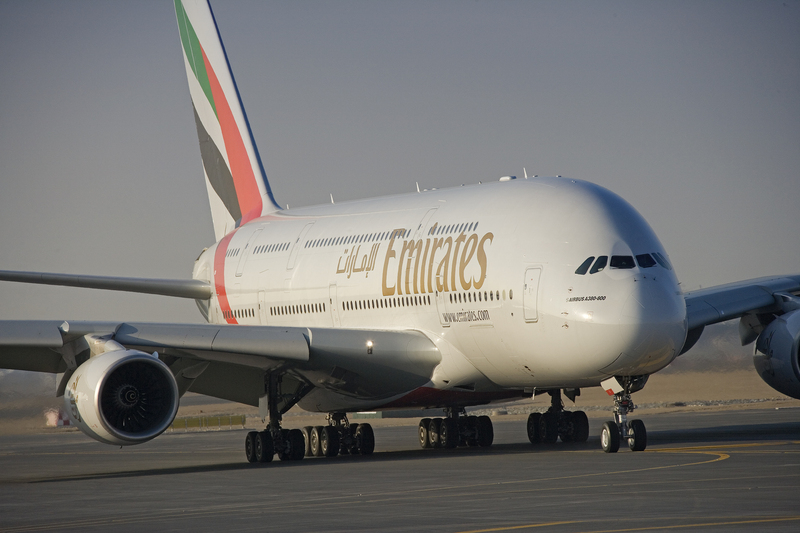 Emirates increases its Dubai - Islamabad flight frequency from 8 to 11 flights a week. 1 Mar 2013. Emirates commences flights from Dubai to Algiers. 6 Feb 2013. Emirates commences daily flights from Dubai to Warsaw. 10 Dec 2012. Emirates commences daily flights to Phuket, Thailand. 5 Dec 2012. Emirates commences 5-weekly flights from Dubai to Lyon. 1 Dec 2012. Emirates increases its Dubai-Perth flight service from 14 to 19 flights per week. 1 Dec 2012. Emirates introduces a permanent A380 service to Singapore. 1 Nov 2012. Emirates commences 4-weekly flights from Dubai to Adelaide. 29 Oct 2012. It was originally planned to restart flights to Tripoli on the 29th October, but this was cancelled. 12 Sep 2012. Emirates commences daily JNB - Washington Dulles flights. EK231 is scheduled to leave Dubai on a daily basis at 02h20 & arrive in Washington at 08h50. 31 Aug 2012. An Emirates flight to Manila makes an emergency stop in Vietnam, after a passenger goes into premature labour and gives birth in the plane's toilet. 9 Jul 2012. Emirates commences flights between Dubai and Lisbon, Portugal. 3 Jul 2012. Emirates commences flights between Dubai and Barcelona, Spain. 15 Dec 2008. Emirates starts 3 flights a week from Dubai to San Francisco, enabling one-stop flights from Cape Town to San Francisco and Johannesburg to San Francisco. 1 July 1993. First Emirates flight to Muscat, Oman. If you're feeling flush or have a few thousand miles to spare, upgrading to Business Class on Emirates is completely worth it! Their Boeing 787 Dreamliner features fully flat beds, which is off course the ultimate indulgence when on a long haul flight. Unfortunately Emirates only uses the dream on their busiest routes, like flights to and from Johannesburg. On their Cape Town and Durban flights they make use of a Boeing 777-300ER which does not feature fully lie-flat beds in Business Class, but seats comparable to a Lay-Z-Boy. The lounge and food isn't too bad either! Video review of the Emirates First Class experience on a flight from Dubai to Hong Kong. First a look around the first class lounge at Dubai International Airport. Then a look at the seat on the plane - doors for privacy, lighting settings, a mini-bar, sleep suits & slippers & entertainment options. There's an Emirates A380 First Class Suite Guide passengers receive, explaining the how to call "room service" with the telephone handset and the "do not disturb" options. There's a shower/spa on the upper deck, a private social area at the front of the first class cabin with leather couches. The first-class toilet is spacious with a TV in it. Emirates offers power outlets in econonomy class on its A380s, B777-300ER (77W) and B777-200LRs. In first class and business class there are power outlets in all planes (except A330-200s). 27 March 2017. Emirates has found a sollution to the ban on electronic devices, excluding smart phones, in cabins on flights to the USA. The airline will allow passengers to utilise their electronic devices until the last possible moment – after which they will be required to hand their laptops or tablets into the care of Emirates staff just before boarding the US-bound flight. The devices will be carefully packed into boxes, loaded into the aircraft hold, and returned to the customer at their US destination. This will be done free of charge to limit inconvenience caused to passengers. Other airlines affected by the ban include Etihad and Qatar, which have not come to a sollution for passenger comfort. 7 February 2017: You can now purchase an Emirates premium lounge pass, irrespective in which class you are travelling. Business Class lounge access costs $100 (approx. R1330) and First Class lounge access costs $200 (approx. R2660). If you are already in Business class, an upgrade to First Class lounge access will only cost you $100. 20 January 2017: Emirates announced that they will launch flights to Zagreb, Croatia, from the 1st of June 2017. They will operate the route with a Boeing 777-300 aircraft, which has been configured with 12 lie-flat seats in first class, 42 lie-flat seats in business class and 310 seats in economy class. 21 October 2016: Emirates president Tim Clark recently announced that the airline is considering cutting back on flights to certain African countries due to dramatic devaluation of their currencies. Could South Africa be included? The airline recently upped their frequency on all SA routes, so it is possible with the looming credit rating downgrade that the airline would cut back. In the meanwhile they have cancelled Abuja flights to Nigeria effective from the 30th of October 2016. 21 Sep 2016 : Emirates is introducing charges for seat selection prior to online check-in (48 hours prior to departure). Passengers travelling on tickets issued from 3 October 2016 will have to pay for seat selection in Economy class. This can vary from 15 to 40 Dollars, depending on the route and is only on the two lowest class economy seats. 26 May 2016 : Emirates has introduced a new lounge to Cape Town International Airport for First Class and Business Class passengers. Skywards Platinum and Gold Members will also receive access to the lounge. The lounge is conveniently located next to Emirates' boarding Gate A3 and features all the modern amenities Emiratees customers have become accustomed to. 23 May 2016 : Emirates and Air Mauritius have extended their partnership, now allowing passengers to earn and redeem miles on both airlines. This will allow Skywards members to earn and redeem miles on Air Mauritius flights. 31 March 2016 : Emirates has extended their online check-in period from 24 hours before departure to 48 hours before departure. This will be both on their mobile and desktop websites. Online check in will still close 90 minutes before departure. 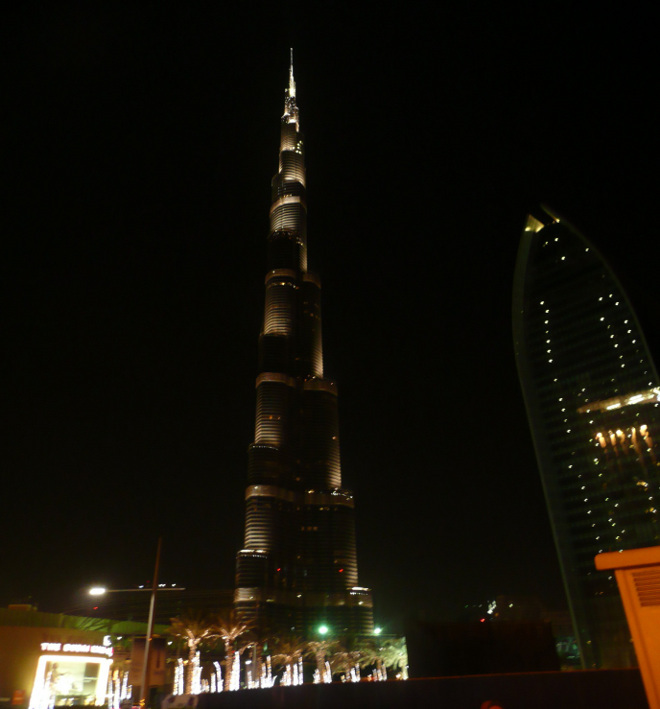 20 August 2015 : Booked an Emirates flight with a long layover at Dubai Airport? Emirates just made it more bearable. If you've got a layover of more than 4 hours between two Emirates flights, Emirates will issue you a meal voucher. Meal vouchers will be issued automatically along with onward boarding passes. So bottoms up! Now you can enjoy your airport coffee guilt-free. 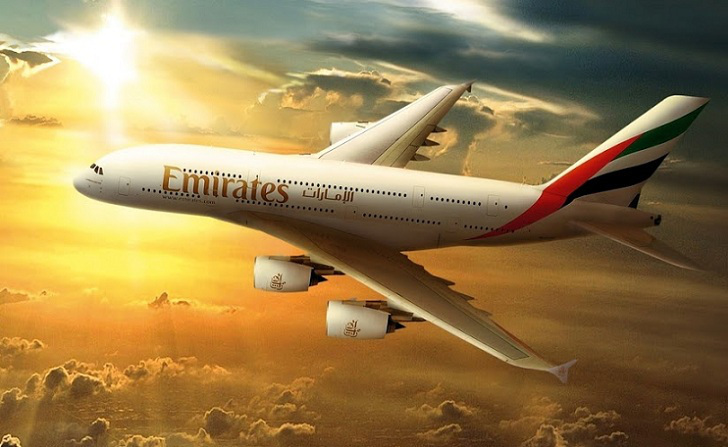 14 August 2015 : Emirates has announced the longest flight! From Febuary 2016 Emirates will be operating the longest non-stop flight from Dubai to Panama City. The flight will last a total of 17 hours and 35 minutes, knocking the 17 hour Dallas to Sydney flight off of the top spot. Surprisingly it is still not the longest flight ever as Singapore Airlines used to operate a 19 hours flight between Singapore and New York. 11 December 2014 : Emirates has announced a partnership with the Lions Rugby union which will see the airline sponsoring the union for 5 years. The airline also has naming rights for Ellis Park Stadium. This partnership shows that Emirates is committed to doing business in South Africa, despite their squabbles with the government over one of their new flights. 1 December 2014 : Emirates will continue to operate all of its current flights to its three destinations in South Africa including the forth daily flight to Joburg. The airline is in talks with the South African government regarding the government’s allegations that the airline had not followed the correct procedures in obtaining the licence to operate the forth daily flight. 17 November 2014 : The Department of Transport has announced that Emirates flights will not be grounded despite the rumour going around that they will. The Times reported that the department would ground the airline because of a dispute between the two parties regarding the airline's fourth daily flight between Durban and Johannesburg. The airline got the go ahead from the department to start the flights but it was withdrawn recently after the department said that due process was not followed. It was reported that the department would ground flights from Emirates until they had a meeting with management from the airline. The department has come out and said that these claims are untrue calling them “regrettable” and “unfortunate”. There will be a meeting between the airline and the department at a time that suits both parties but flights will continue as usual in the meantime. 7 November 2014 : Emirates will be launching a fourth daily service from Dubai Int. Airport to John F. Kennedy Int. Airport (JFK) in New York from the 8th of March 2015. Flight EK 207 is scheduled to depart Dubai at 14h50 and arrive in New York at 20h35. Flight EK 208 (the return flight) will depart New York at 16h30 and arrive in Dubai at 13h15 the next day. 13 October 2014 : At the recent Africa Global Business Forum 2014 held in Dubai Sir Tim Clark the President of the airline recommitted his airlines support to helping stimulate Africa’s regional growth. Mr. Clark said that the government of Dubai recognised the economic potential of Africa early on, investing upwards of $7 billion in their fleet and $2 billion in operational costs towards their African operations. He also said that Emirates will be adding around 10 African destinations over the next 10 years. Emirates still believes that Africa is a underserved market which they are aiming to fill over the next couple of years. 22 September 2014: Emirates has temporarily suspended flights to Sana'a, Yemen following renewed conflict in the capital. 9 September 2014: Emirates has launched new daily services from Dubai to Brussels and Oslo. Both routes are operated by Boeing 777-200LR aircraft. Emirates are set to further expand their operations to Europe next month with the launch of a new daily flight to Budapest which is set to start flying on the 27th of October 2014. 14 August 2014: From 26 October Emirates will add a fourth daily flight to Johannesburg, increasing the number of flights to South Africa to 49 a week. Emirates is attributing this growing demand to increased leisure travel from South Africans. 4 August 2014: Emirates announced that it will be avoiding Iraqi airspace following the tragic Air Malaysia MH17-incident last month. Whilst no real threat has been detected this is regarded as a precautionary step. Emirates made the announcement public over the weekend after which several other airlines followed suit or made public that they have been avoiding Iraqi airspace for some time. Other airspaces being avoided include war-torn Syria, Libya and Crimea as well as Iran and North Korea. Emirates also announced that they are halting all flights to Guinea to avoid the Ebola-infected area. 16 July 2014: Emirates have announced that they will be introducing a fourth daily flight from Dubai to Johannesburg. The forth flight will start operating from the 26th of October 2014. Emirates who are one of the world’s leading airlines will then have seven daily flights to South Africa. An increase in demand for flights from Dubai to South Africa is what brought about this new daily flight. 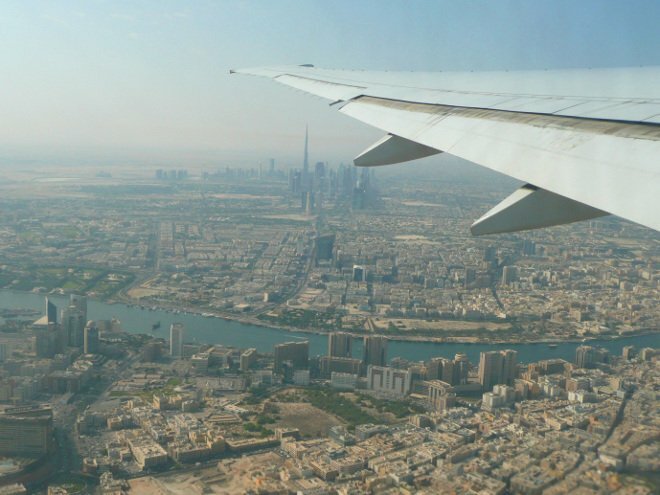 Dubai is a connection hub for many travellers from South Africa who are heading to Europe, the US and Asia. Flight are usually cheaper to these destinations when who connect through Dubai. Emirates will from the 26th of October 2014 be operating 49 flights to South Africa every week, making it one of the biggest flight operators into South Africa. 18 February 2014 : A Russian flight attendant fell out of an Emirates plane parked at Dubai Airport, after a catering truck crashed into the aircraft. The stewardess was taken to hospital where she had an unspecified operation. The plane was about to fly from Dubai to Perm (Russia). A similar incident occured in South Africa in April 2013, when a cabin crew member slipped and fell off a British Airways Comair plane in Durban, with serious injury resulting. 2 Jan 2014. But officer, I just wanted a smoke! A German citizen, Mathias Jorg, who kept on trying to smoke on an Emirates flight EK432 to Brisbane, Australia, is detained by police after the plane landed. He was charged with smoking and assaulting the crew resulting in them not being able to perform their duty. He has been allowed out on bail providing he not go within 100m of any international departures areas and surrender his passport. The closing date for the Emirates Skywards Future Artists contest is the 23rd July 2013. 30 May 2013. Emirates agree a new shirt sponsorship deal with Real Madrid. Real Madrid's shirt will carry the words 'Fly Emirates'. 5 Dec 2012. Fastjet, an airline based in Tanzania but listed in London, announces that it is in talks with Emirates over a possible partnership. Feb 2012. Emirates introduces a new functionality which allows passengers to change their time or date of travel, add flights and upgrade to business or first class. This online functionality is available regardless of whether you booked through an Emirates agent, on the phone or via the website. The functionality exists for all Emirates' global websites, including South Africa. 1 Dec 2011. To ensure one-time departures from Terminal 3 Dubai Airport, Emirates is closing its check-in counters an hour before a flight's scheduled time of departure. Passengers who have baggage for the hold must check in at least 90 minutes before the scheduled departure of their flight. Boarding gates close 15 minutes before the flight. 1 Oct 2011. Emirates flights EK761 and EK762 between Johannesburg and Dubai start to be operated with an Airbus A380 superjumbo jet. Senior Vice President for Commercial Operations of Emirates in Africa, Jean Luc Grillet, said that "The demand for Emirates’ services in and out of Johannesburg has always been high, with passenger growth of more than 27 percent over the last year. It is fitting that our A380 is now serving South Africa and we would like to thank the Department of Transport and OR Tambo International Airport for their efforts in enabling us to bring this exceptional aircraft to Johannesburg. The UAE and South Africa’s strong and successful relationship has been built on the twin pillars of trade and tourism. In introducing our flagship aircraft and the extra capacity it offers, Emirates will help to further boost this important partnership". 9 Dec 2009. Emirates opens a specially branded business class lounge at Johannesburg's O.R. Tambo International Airport. The lounge boasts flat screen TVs, showers, leather chairs and chef-prepared meals. The lounge is available to members of Emirates' Gold Skywards frequent flyer programme and passengers holding first and business class tickets. The lounge has seating for 135 guests. 22 Jul 2009. Emirates launches its first airport lounge in Africa at Johannesburg's O.R. Tambo International Airport. At the same time plans are announced for airport lounges at in Birmingham, Hamburg and Manchester airports. 12 Apr 2009. Nigel Page is appointed Senior Vice President for Emirates’ Africa region (added to his existing responsibilities as Senior Vice President Commercial Operations for the Americas). 06 December 2013. Rating 5/5: Annette Singh enjoyed an Emirates flight to India, and was delighted by the level of in-flight service that she received. 14 November 2013. Rating 1/ Shamam caught an Emirates flight from Pakistan to Harare, and was disappointed that her son did not get the birthday cake he'd been promised. 12 August 2013. Rating 5/5 : After much research Nombulelo chooses an Emirates flight from Johannesburg to Manchester as her first international flight, and is amazed by the views of clouds: "Growing up I had always wondered if clouds were like cotton candy or ice cream or both and flying through them and seeing the thick white clouds up close and personal was unforgettable. It felt like a dream." 9 January 2013. Mariette explains how she was nearly having a breakdown at the airport in Johannesburg, before being rescued by an Emirates staff member, and is now a lifetime Emirates fan. 3 January 2013. André joins a 'seat guru' on an Emirates flight from O.R. Tambo: "Word must have got out that the guru was on board and like a child in transit he needed just a little bit of extra care. In the hours that followed as we drifted over the clouds the guru revelled in the amazing on board entertainment. I would occasionally emerge from my slumber to his laughter or him accepting the snacks and drinks the air stewards kept coming to offer him. 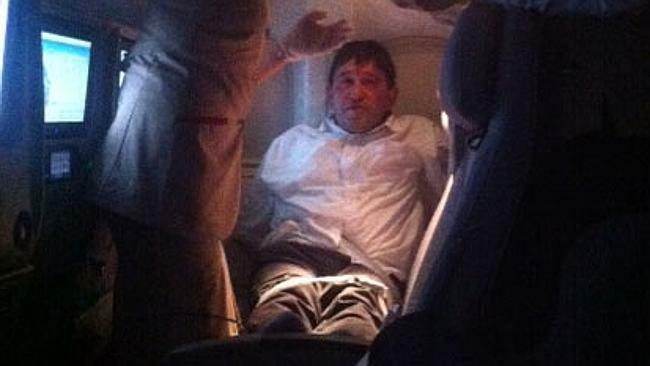 Maybe this is how business and first class people get treated all the time?" SouthAfrica.TO does not necessarily agree with the views expressed in these Emirates flight reviews. 2013-07-20 Best Food & Wine : Readers of Frequent Business Traveler have said that Emirates' Food & Wine is the best in the world. “At Emirates, we are always in pursuit of excellence and are constantly seeking to ways to deliver the finest product when it comes to hospitality. Food and Beverage are at the core. We are dedicated to offering our customers the finest cuisine in the world using the very best of produce that we can source. We believe that it is these high standards that keep our loyal customers coming back. We will continue to push the limits and explore new ideas, to ensure we are offering our passengers a dining experience that is comparable to some of the finest restaurants in the world". said Emirates VP Catering, Robin Padgett. 2013-06-19 Emirates is World's Best Airlines : Emirates has won Skytrax's "World's Best Airline" award, which was presented at the Paris Airshow. "Being honoured with these awards is testament to our unrelenting effort to be the world's best airline. We are constantly striving to offer our customers consistent, world-class service that extends from the moment they make their booking to the moment they arrive home at the end of their journey." said the President of Emirates, Tim Clark. The rest of the top 10 were Qatar Airways, Singapore Airlines, ANA All Nippon Airways, Asiana Airlines, Cathay Pacific, Etihad, Garuda, Turkish Airlines and Qantas Airways. 17 November 2013 : At the Dubai Airshow Emirates places an order for 50 more A380s. 6 May 2013. Tim Clark, President of Emirates, says that they plan to upgrade "a large chunk" of B777's to B777X's: "I'm looking to replace a large chunk of them (777s). It'll be a large order." On its Airbus A319, Emirates offers a private luxury jet experience. 2 November 2015. Emirates has signed a codeshare agreement with Alaska Airlines. In accordance with the agreement Emirates will not only be able to market Alaska's flights, they will also be able to offer reciprocal lounge access and priority boarding and check-in for elite flyers. 28 January 2014. The era of the codeshare continues, with Emirates signing a ticketing agreement with Proflight Zambia, to enable their clients to book a single combined ticket with Emirates & Proflight Zambia flights on it. 16 December 2013. Emirates signs an enhanced codeshare agreement with Air Mauritius, with Emirates launching an Airbus A380 service from Dubai to Mauritius, and allocating more seats to Air Mauritius to sell. Air Mauritius will also sell onward flights from Dubai. “I am delighted with this new agreement with Emirates. It is an important agreement for our two airlines as it provides Air Mauritius with the opportunity to offer our passengers, business partners and the country at large, better access to a broader network. Emirates is one of our key partners, which has consolidated its presence worldwide in a very short time through its Dubai hub. Air Mauritius was collaborating with Emirates and with this enhanced agreement, Dubai becomes an important hub in our network” said Andre Viljoen, the Chief Executive of Air Mauritius. December 2013. Emirates confirms that it is not interested in buying a stake in the financially embattled Qantas Airlines. 15 August 2013. The Emirates/Qantas partnership officially starts, with codeshares being enabled. Apr 2013. Emirates launches a partnership with Qantas, with Qantas flights to Europe now stopping over in Dubai instead of London & Asia, and Emirates flights moving them onward. 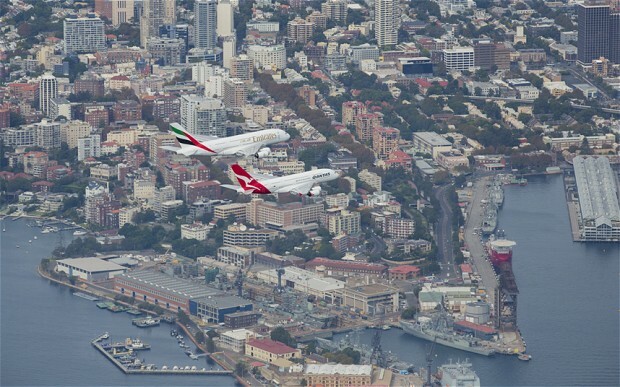 To celebrate, they flew an A380 together over Sydney. Emirates is owned by the Government of the United Arab Emirates (UAE). Top 5 places from which Emirates are flying people from, to visit Africa are : Dubai (UAE), London (UK), Beijing (China), Guangzhou (China) & Mumbai (India). A sign of the times that 2 of the top 5 are cities in China. Want to make a booking? Click here for the booking engine.